On March 10, Mt. Hebron’ science teacher Mr. Daniel Blocklin and his hockey team participated in the Naval Academy Hockey for Heroes tournament raising $2,746 towards wounded veterans organizations. These organizations include the Wounded Warrior Project, USA Warriors Ice Hockey, Truckin 4 Troops and Fisher House Helping Military Families. This event is a 24-hour round-the-clock exhibition tournament. The tournament began on Friday, March 9 at 6 P.M. and lasted until Saturday, March 10 at 6 P.M. A few of the special guests at the event included the USA Warriors hockey teams, the West Point Junior Black Knights and many more local and regional teams. “This event makes me think about the sacrifices that veterans have made. 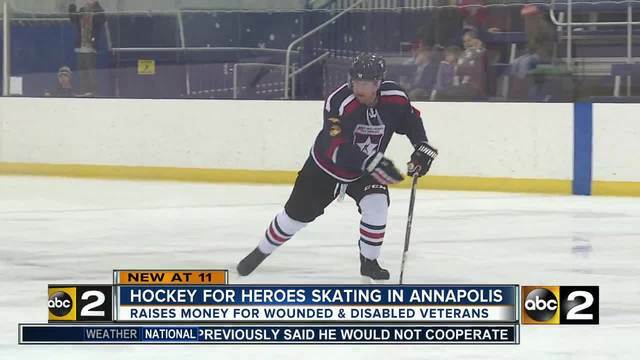 Hockey for Heroes allows me to give back to the men and women of our armed forces who have sacrificed so much while playing a sport that I love,” said Mr. Blocklin. Before the event, teams were encouraged to collect at least $1,000 in online donations towards the wounded veterans organizations. Donations could also include helmet collections, sponsorships, merchandise, raffles and a silent auction in which they could participate. So far in 2018, there has been a total of $34,330 raised on the way to the goal of $75,000. “Almost all of the funds raised goes directly to the charities to benefit our wounded veterans. In addition to the donations, funds are raised through a silent auction that takes place during the games,” said Mr. Blocklin. Another major organization is the Fisher House. This foundations main goal is to build comfort homes where military and veterans families can stay free of charge while a loved family member is in the hospital. Hockey for Heroes continues to raise money for these causes and hosts the event every year.